Background diabetic retinopathy or BDR is named appropriately because it sits in the background, not itself a danger to vision, but is instead a warning sign that serious damage may be starting. Directly above the white arrows in the picture are two small flame shaped hemorrhages with tiny microaneurisms seen along either side of the vessel between the arrows. This warning sign is difficult to interpret---80% of people who have had diabetes for over 20 years have some BDR, but only about 1 out of every 4 or 5 of those with BDR will eventually suffer measurable vision impairment. Microaneurisms: these are usually the earliest visible change in retinopathy seen on exam with an ophthalmoscope as scattered red spots in the retina where tiny, weakened blood vessels have ballooned out. Hemorrhages: bleeding occurs from damaged blood vessels into the retinal layers. This will not affect vision unless the bleeding occurs in or near the macula, causing Diabetic Macular Edema. 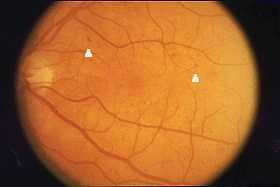 Hard Exudates: caused by proteins and lipids from the blood leaking into the retina through damaged blood vessels. They appear on the ophthalmoscope as hard white or yellow areas, sometimes in a ringlike structure around leaking capillaries. Again vision is not affected unless the macula is involved. BDR is usually picked up on routine eye exams in a doctor's office, or during an exam by an ophthalmologist or optometrist. BDR is an early stage of damage that is visible before vision is endangered and before any symptoms are present. Like "borderline diabetes," it should never be ignored because it signifies that some damage to blood vessels is already underway. Anyone who has BDR can benefit from regular urine tests for microalbumin. The presence of excess microalbumin in the urine identifies people who are 15 times as likely to go on to develop severe eye damage. This is an excellent time to begin the preventive measures to be discussed in next month's column. Another warning sign that the eyes are at risk for serious diabetic retinopathy is loss of dark adaptation. This loss in the ability to adapt to the dark is easiest to notice while visiting a movie theater. If you walk into a darkened theater and have to wait in the aisle while other people pass you by on their way to a seat, you likely suffer from decreased dark adaptation and may be at a greater risk for eye damage. If BDR is not heeded and blood sugars are not controlled, three later stages of damage to the eye can occur. These are preproliferative retinopathy, proliferative retinopathy, and macular edema. Cataracts are also described because they occur more frequently when blood sugars are poorly controlled.